The Sufi tradition is like a vast garden in which are cultivated many flowers of different scents and colors, each sweet and beautiful, each reflecting one aspect of the garden of paradise, and each with its own particular form. There are certain Sufi writings that are primarily practical and operative, others that express the metaphysical and cosmological doctrines of the tradition, and yet another group that makes use of parables to convey the message of Sufism. Moreover, although the reality of Sufism is everywhere the same, containing and reflecting the very heart of the Islamic message, its models of expression have taken into consideration the artistic possibilities of the people whom they have addressed and the genius of the languages they have employed. In this garden of divine mysteries, there have appeared certain flowers whose perfume has filled the world and been appreciated for centuries in lands near and far. One of them is Persian Sufi, Poet and Mystic Fakhruddin 'Iraqi (often referred to as 'Araqi), may God bestow pure grace upon his noble soul. Fakhruddin Ibrahim 'Iraqi was a fascinating figure who bridged several Sufi traditions. He is known as one of the foremost expositors of Sufi teachings, one of the greatest of Persian poets, and a supreme artist among those who have attained an exalted station of spiritual realization within the Sufi tradition. 'Iraqi lived during the thirteenth century at the peak of the revival of Islamic spirituality, a time that is like the echo of the opening century of Islam. He was contemporary with such giants of Sufism as Ibn Arabi, Jalaluddin Rumi, Sadruddin Quranwi, Najmuddin Kubra, and Abu'l Hasan ash-Shadhili, men whose teachings dominate Islamic spirituality to this day. He himself was a leading light in a period so luminous that its brilliance still dazzles the eye some seven centuries later. The spiritual training of 'Iraqi, as of every adept of Sufism, was of course not through literature or even formal religious education. It was through initiation and spiritual discipline. Everything else followed from that fundamental and central training, which aimed at the purification of the heart, the goal that is basic in Sufism. 'Iraqi became a work of art before producing works of art. If he sang the love of God in verse of great beauty, it is because his soul had itself become a song of God, a melody in harmony with, and a strain of, the music issuing from the abode of the Beloved. 'Iraqi was a gnostic who spoke in the language of love. For him, as for Sufism in general, love is not juxtaposed to knowledge. It is realized knowledge. The Truth, which is like a crystal or a shining star in the mind, becomes wine when it is lived and realized. It inundates the whole of man's being, plucking the roots of his profane consciousness from this world of impermanence and bringing about an inebriation that must of necessity result from the contact between the soul of man and the infinite world of the Spirit. But 'Iraqi was a Sufi gifted particularly in expressing the "mysteries of Union" in the language of love. He belongs to that group of Sufis, like Ruzbahan Baqli, the patron saint of Shiraz, who have been called the fideli d'amore of Islam. The Lama'at (Divine Flashes), the masterpiece of Fakhruddin Iraqi, is translated in English by William C. Chittick and Peter Lamborn Wilson (Hakim Bey), published from Paulist Press in Classics in Western Spirituality Series. The Lama'at of 'Iraqi belongs to a particular type of Sufi literature in which the purest doctrines of gnosis (al-ma'rifah) were expressed in the language of love (al-mahabbah). The first work of this kind in Persian literature is the Sawanih fi'l-'ishq (Spark of Love) of Ahmad Ghazali, the brother of the better known Abu Hamid Muhammad Ghazzali. 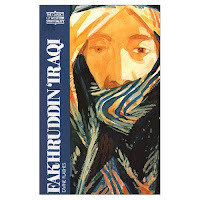 This remarkable literary and spiritual masterpiece was followed by the Risalah fi haqiqat al-'ishq (Treatise on the Reality of Love) by the founder of the school of illumination, Shihabuddin Suhrawardi. The Lama'at of Iraqi is the third major work in this genre of Sufi writing. There are in fact some who claim that the Lama'at is the most beautiful work of its kind in Persian literature which at once is a metaphysical treatise and a work of art. The translation work is prepared by William Chittick and Peter Lamborn Wilson. Chittick is a pre-eminent expert in Sufism and particularly of the school of Ibn Arabi. He has written some of the most scholarly and metaphysically penetrating studies of the followers of Ibn Arabi especially Sadruddin Qunawi and Abdurrahman Jami. Peter Wilson on the other hand is an American sufi poet and thinker. In any case their combined efforts make accessible in a manner that is satisfactory at once from the point of view of scholarship and literature one of the most precious pearls of Sufism. Iraqi was a dervish that wandered into the same Konya that was home to Rumi., a student of Rumi's friend Sadruddin Qunyawi (disciple to Ibn Arabi). Iraqi's Flashes are the synthesis of Ibn Arabi's metaphysics and the love theory from Ahmed Ghazali's Sawanih. While Chittick's great prose translations may never compare to the beauty of the persian originals, yet the powerful ideas expressed in the poetry trigger enlightening thoughts and awaken the soul. While Muslim philosophers say technical statements like: "God is the necessary Existent" or "All existence is a manifestation of divine attributes", the poet Iraqi says: NOTHING EXISTS BUT LOVE. You are a LOVER, you just don't know it YET. and see the universe but an image of that image. that every atom becomes a vehicle of my manifestation. and the shapes of men? - The vessels of my bodily form. purest Light? - But a spark of my illumination. In Islamic thought, the traditional authorities speak of "transcendence" (tanzih) and "immanence" (tashbih), or the "negative" and "positive" ways, of which the second corresponds more to the perceptive of 'Iraqi. He and Sufis like him see the phenomenal world not as the "veil", but rather as the mirror reflecting God's Names and Qualities, or as a symbol of the spiritual world. For them beauty is not the cause of seduction, but the occasion for recollection of the spiritual archetypes in Platonic sense. Of course God is transcendent and one must renounce and leave the finite in order to reach Him. But He is also immanent. Therefore when man has passed through the stage of renunciation and separation from the world of forms for the sake of Formless, it is possible for him to return to forms as the mirror of the Formless. But this can happen only if the first stage - that of renunciation, asceticism, and separation from the world - has been experienced. For as Frithjof Schuon has stated, "It is not possible to experience God as Immanent without having experienced Him as Transcendent." But having experienced Him as the Transcendent, it is possible in Sufi spirituality, as in most other authentic traditions, to become aware of the metaphysical transparency of forms and to be able to contemplate the One in the multifaceted manifold. It is this perspective that makes possible a "spiritualized sensuality" that is very different from the dualism that would totally oppose the spirit to the flesh and mind to matter. This is compartmentalization from which many modern Westerners suffer as a result of a complex set of historical factors, including of course Cartesian dualism, which has constructed an impenetrable wall between "mind" and "matter." This philosophical dualism has furthermore become fortified by a kind of religious dualism that also sees a total and final opposition between the spirit and the flesh, as if there were no doctrine of the resurrection of the body, in Christianity as in Islam. The result of these factors has been spread a kind of religious mentality for which it would be difficult to imagine how a person with serious spiritual intentions could talk in sensuous terms, employing continuously the image of wine or human body. To understand the point of view of an 'Iraqi, it is necessary to transcend the dichotomy and to return to the more traditional perspective, which is also present in certain school of Western spirituality. In the perspective of 'Iraqi there is no irreducible dichotomy between divine and human love or divine and human beauty. There is a gradation from the love of forms, which is "apparent love" (isqhi majazi), to the love of God, which alone is the real love (ishqi haqqi). The lower form of love can be, and for the Sufis is, the ladder to Divine Love. Ultimately, to love anything is to love God, once man realize that there is but ONE LOVE. Likewise, there is a gradation of beauty from formal, human, and terrestrial beauty to Absolute Beauty Itself, the "Beautiful" (al-Jamil) being a Name of God. In a profounder sense all beauty is like a drop that has fallen from the Divine Cup upon this world of clay. It thus brings about recollection, it frees and saves. For the soul of the gnostic, beauty is like fresh air without which one would die in the suffocating space of the world of limitation.
. Who do we really Love?